There is an abundance of wildlife living within urban areas. Respect and protect it by being responsible with your trash. Just 10 days earlier, I happened upon a little bird that I'd never seen before. This was at Hillside Cemetery in Northeast Minneapolis over my lunch break. It was a very tiny bird that moved incredibly quickly and often but it didn't look like anything I'd ever seen. 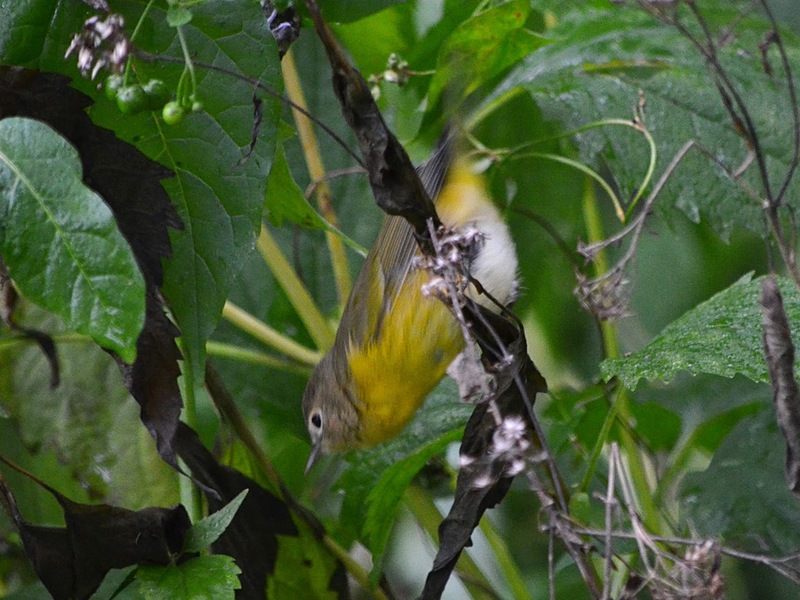 It had a mostly white breast but I was catching glimpses of bright yellow on it's head. I assumed it was a Warbler of some kind. After several dozens of shots that came up with an empty branch, I began thinking to myself "what is the only other bird I know that moves this quickly?" A Ruby-crowned Kinglet was my answer. 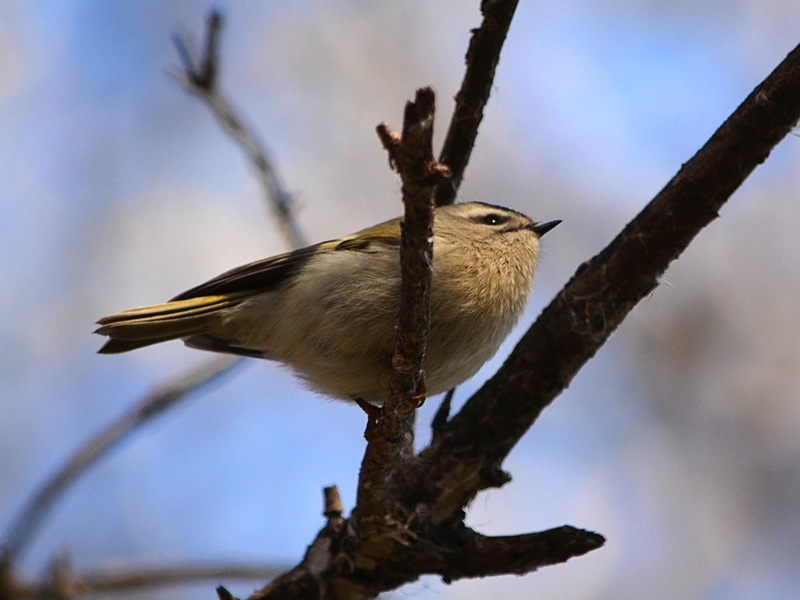 Then it hit me –there was another type of Kinglet! 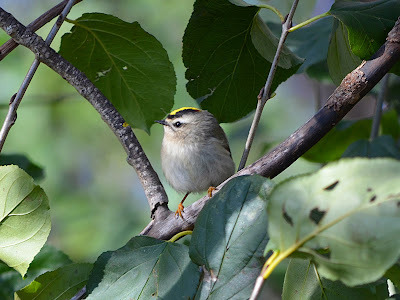 I looked him up on my phone right then and there and realized I was seeing a Golden-crowned Kinglet! I was so excited to have stumbled upon something new but my photos weren't too great. I even went back to the cemetery that evening after work, attempting to locate them again but no such luck. I never considered that I might see them at PLP but today I did. And even more exciting was that I ran into them several times today in different parts of the park! In the end I was able to get at least 2 post-able shots to share here, but this was 2 out of probably 50 shots I took. In the very brief instances that I've been able to see this new bird, I've decided that one clue you could go by to identify one is that they almost appear to have no neck. Their head seems to be almost part of their round little body, giving them a "chubby" appearance much more than any other bird I know. I've also learned that while both male and female have a bright yellow crown atop the head, only the male has an additional tiny little orange-red patch at the back of his crown, making his crown appear more of a rich orange all around. I was able to see that in at least 2 of the birds I saw today and you can just barely make it out in my first photo here. I was quite excited to get to see this bird for only the 2nd time ever –and especially excited to see it at PLP! 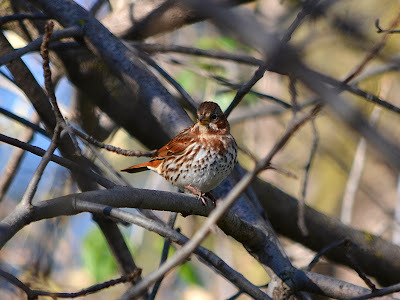 One more bird that is coming through now with the change in weather, is the Fox Sparrow. I became familiar with these only over the last couple of years but now I can pick them out easier than before. 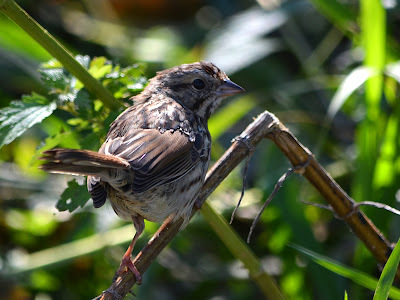 First and foremost they are noticeably larger than other sparrows. And since they often are among other Sparrow species, you can see the difference in size quite easily. They are also often colored a rich, rusty red, contrasting a lot against their bright white but speckled breast. This one was posing in the bright sun for me, making him appear even more distinctive than I would have previously thought. I've not heard this bird make too many sounds but upon looking it up I found they have quite a unique and beautiful voice. As I neared my vehicle back on the east side I caught a quick glimpse of a small bird land in some weeds just below me. I got off just one shot before he flew away and I ended up getting a pretty neat shot of a Song Sparrow. Though I definitely notice the return of Song Sparrows in the early spring, I've not paid particularly close attention to when they might leave. After just looking now at their range map, it seems both their summer and winter territory almost converge in southern Minnesota. It was an absolutely gorgeous day this Saturday to be hiking around the park. Despite our days starting off quite cold in the morning, the temperature today made it up into the 50's. I saw a good amount of interesting birds today and some that didn't make this post were: Northern Cardinal, Dark-eyed Junco, Song Sparrow, White-throated Sparrow and Fox Sparrow. 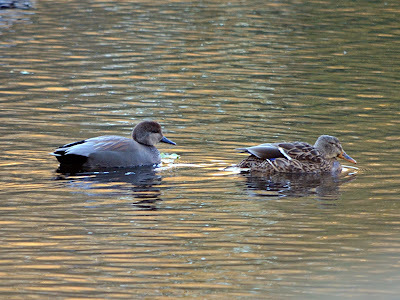 The first bird of interest I was able to capture however was a Gadwall swimming among the other Mallards in the "Duck Pond" on the southwest corner. I believe this is the first and only time I've seen one here in the fall versus the spring. And furthermore, something makes me think that this might actually be the very same duck I saw earlier this spring. 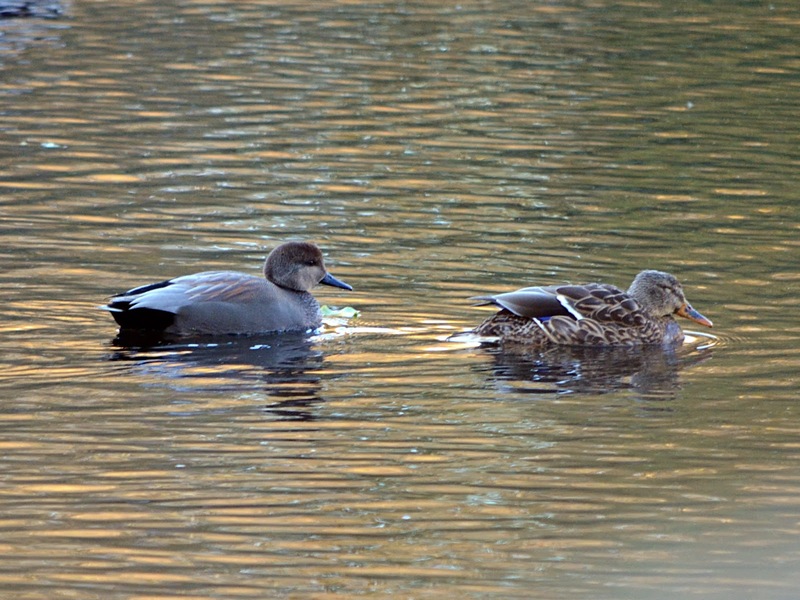 Again it was just one male Gadwall with the Mallards and in the exact same place as in March of this year. 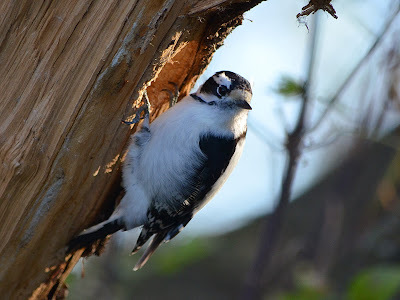 As I hiked up the wood chip trail on the west side I spotted a Downy Woodpecker busily carving out a hole in a dead limb right at eye-level. I normally wont go out of my way to photograph Downy's or Hairy's but I'll never pass on any bird that is so close. But even at this distance it can be hard to catch a Woodpecker without their head in motion. This was a female Downy as indicated by a lack of red feathers at the top, back of the head. I tried to only snap pictures during the brief moments she paused her steady pounding into the tree. Later on the north end of the park I ran into two other bird-watching friends of mine and I ended up heading back the way I came in order to walk with them. They told me that they'd spotted the Northern Shrike returned to the park just some days earlier –which would be approximately within the same week that I'd first spotted one last year, October 27th 2012! I thought that was pretty neat. 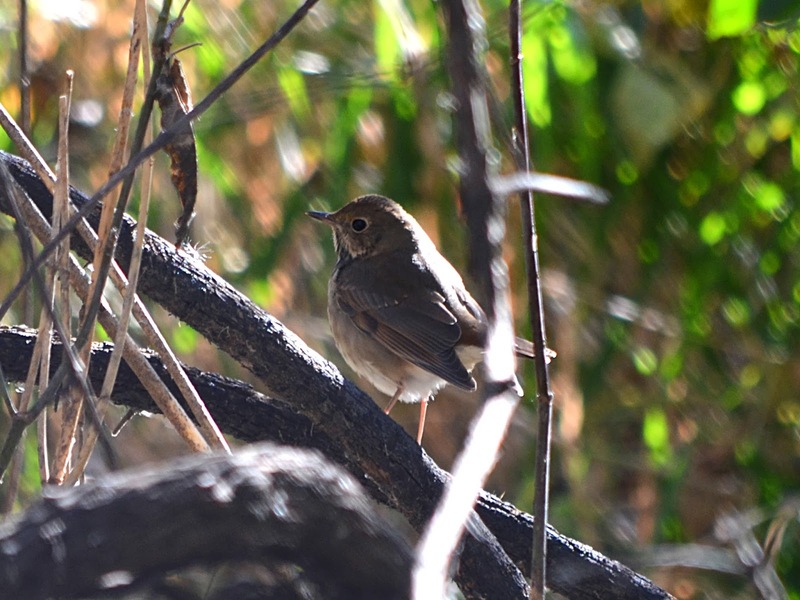 Unfortunately I didn't see a Shrike this day but we did spot a Hermit Thrush within photographic range. I see Hermit Thrushes quite often in the spring, about the time when there are only small patches of snow left on the ground. I'm still trying to learn the difference between a Hermit Thrush and Swainson's Thrush which look very similar. I believe one indication is that a Hermit might bob it's tail while the Swainson's does not. I'm not 100% on that though. Three more fairly similar looking birds, the Wood Thrush, Gray-cheeked Thrush and Veery, can also be found in our area but I'm afraid I'm not quite experienced enough yet to quickly tell them apart in the field. An interesting fact; all Bluebirds and your common everyday American Robin are both part of the "Thrush" family! 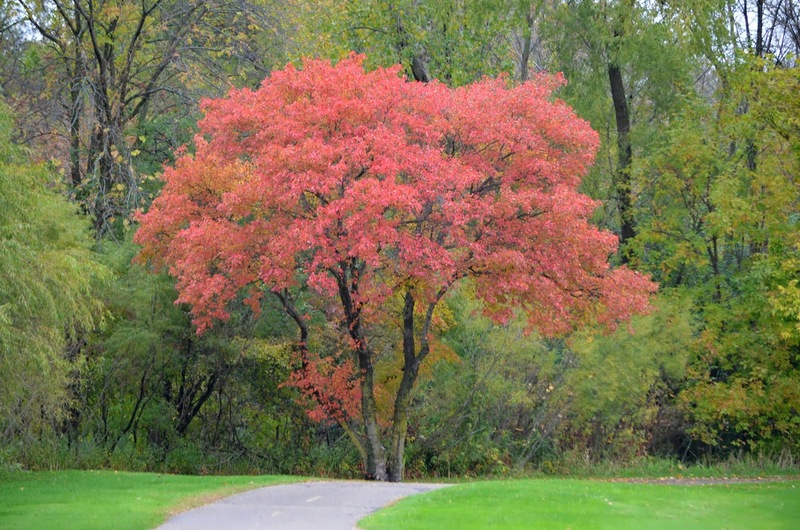 Somehow most of October has passed by without many visits to Palmer Lake Park. Now with the daylight hours dwindling so rapidly, it's nearly impossible to fit in a full walk (all the way around) after work. And it's ever harder to get decent photographs with such low light. So my visits are narrowing down to weekends only and after being out of town last weekend, I was itching to get back to PLP. This afternoon I hiked around the park with someone whom I first met while at the park. I remember the first thing she ever said to me –"that's a Yellow-rumped Warbler"– as I spied on one through my binoculars while standing on the bridge over Shingle Creek. I immediately liked her and found that we not only shared an interest in birds but in Palmer Lake Park as well. She has quite a passion for the environment and is also one of the most knowledgeable people I've ever met in regards to plants. I don't know if she realizes how much her friendship has inspired me to learn more about nature. And had we not met, I really doubt that Friends of Palmer Lake Park would have ever been founded. The on-again-off-again rainy weather we had yesterday decided to continue again today. Now that I've upgraded to such a larger camera, this type of weather makes it harder than any other to hike around the park taking photos. I've seriously thought about buying some kind of weather protection for my camera but I've procrastinated about it and instead carry a selection of large plastic bags with me instead. When I was on the south side overlooking the lake I could really see a swath of rain moving over the park and tried to capture it in a photo here. Things are still pretty green everywhere in the park but the cattails are showing just a tinge of rust coloring now that it's October. I saw a handful of interesting birds, of which most I didn't get a good photo of. These included a Least Flycatcher, House Wren, and a pair of mottled birds weaving through the grass that I'm pretty sure were two female Pheasants. There's also a few new mushrooms popping up here and there and though I really don't know any of them by name, they can still be fun to photograph. 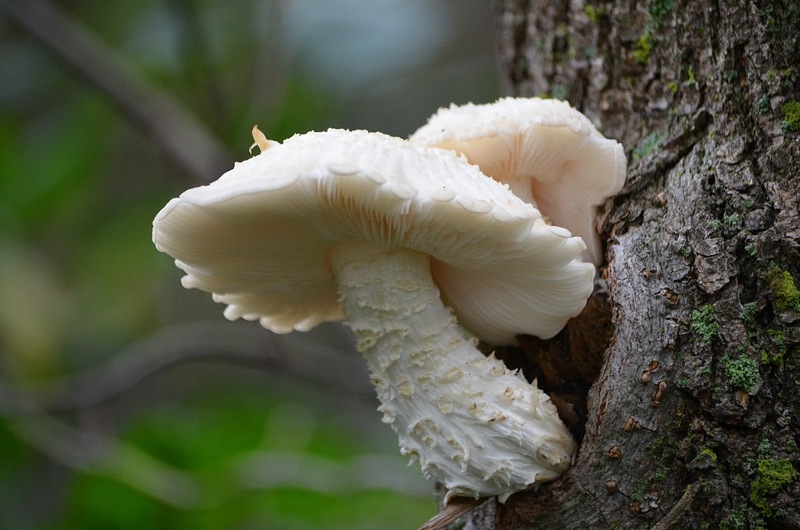 I've recently heard someone refer to these at "Tree Mushrooms" but I'm sure they have another name. I never realized until a few years ago that mushrooms that look the same as you find on the ground will grow right out the side of a tree. Now I see them quite frequently. Almost always they are growing out of a hole where a dead branch broke out, making me think that the spores are simply finding a good place to settle and grow. Later near the end of my walk I spotted one more bird that I tried to photograph but was moving quickly. I'm pretty sure this was a Nashville Warbler, of which I've only seen just once or twice at the park. 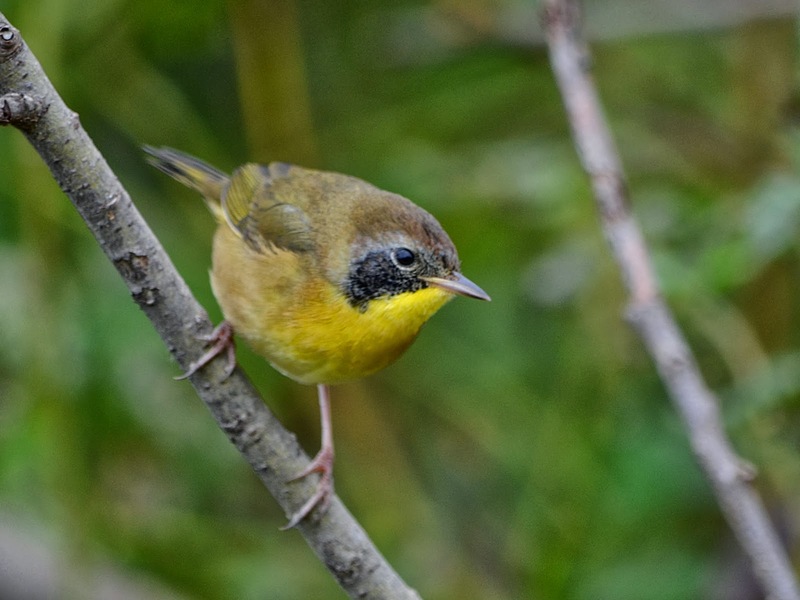 So despite the less than favorable photo, I'm posting here anyway just because I have so few pics of this Warbler. Well today is Saturday and it's been raining almost continuously since Thursday evening. And when it's not raining, it looks like it might start again at any moment. So when I arrived at the park this morning I had my rain jacket on just in case. 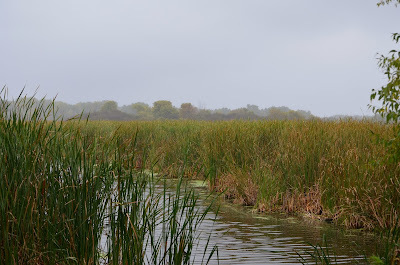 It was quite overcast and dreary but at the time I didn't realize it would be the nicest part of the day! I was pleasantly surprised to see so many birds today and I had a few close encounters that resulted in some neat photos. Some of the more memorable sights of the day included Ruby-Crowned Kinglet, Yellow-rumped Warbler, Hairy Woodpecker, Red-bellied Woodpecker, Pileated Woodpecker, Song Sparrow, White-throated Sparrow, Tree Sparrow, Eastern Phoebe, Northern Cardinal, House Wren, Common Yellowthroat, Eastern Bluebird, and an Ovenbird! I was bummed that I didn't get any photos of the Ovenbird worth posting here, though I sat and waited patiently for quite a while hoping to see him again. 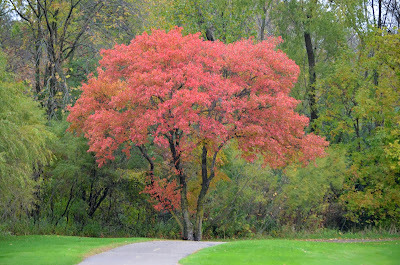 It is only maybe the 2nd time I've seen one in the fall as opposed to in the spring. 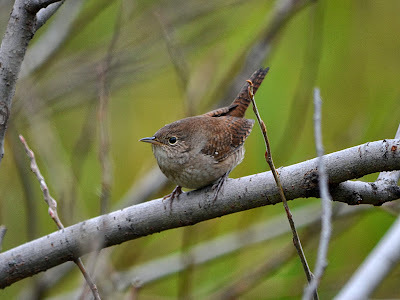 I had no problem getting this first bird here, a House Wren. There were a pair of them together in a shrub with little to no leaves. When I went in closer to see them they seemed to become interested in me and came right out to the edges in plain sight. I've had similar instances with Wrens and I'm realizing that they must be one of the most curious of all birds I've encountered. There were other small birds in the very same shrub and a flash of yellow caught my eye only seconds after snapping the Wren photo. Here was a Common Yellowthroat also very close and unobstructed and I was lucky enough to catch just this one shot. It is un-mistakenly a male as indicated by the black mask, but both his black mask and white stripe above it are faded considerably. I've not had an opportunity to see one this closely so late in the season before so that was kind of a treat. My favorite sighting of the day however was still to come and I barely noticed it just 30 seconds before I had decided to get back in my vehicle. On the east side right near the parking lot I spotted a flash of bright blue on the ground and noticed not one but two brightly colored male Bluebirds! They were drinking from a small puddle that collected in a low spot from all of our recent rain. I decided to sit down on the ground but of course I scared them off quickly. But they didn't go far, only straight up into the trees above me. After sitting here for only just a few moments I became aware of just how many Bluebirds –and other sparrows– that were taking a liking to this area. I bet there were at least 6 male Bluebirds around. I didn't notice any females but I'm guessing they were also around somewhere. As I watched the little puddle in front of me, another larger puddle off to my left became the new gathering place. 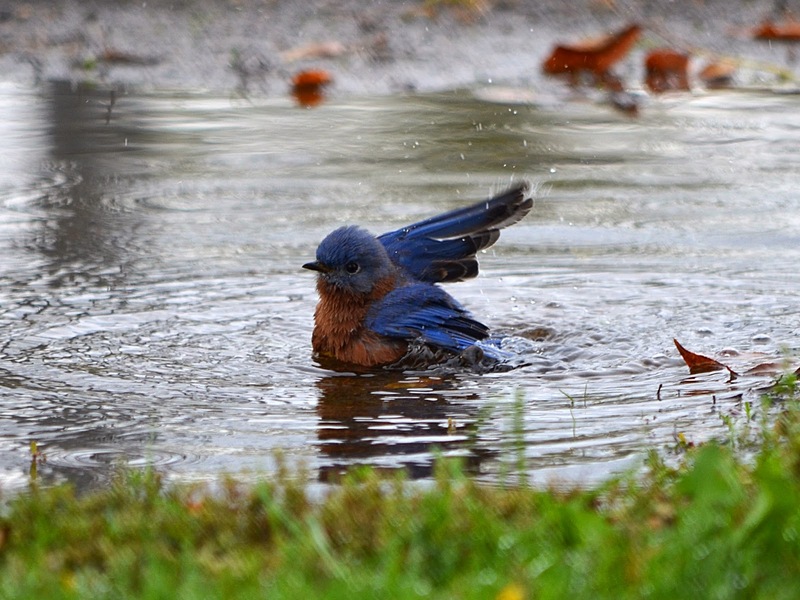 Both Tree Sparrows and Bluebirds would wade in and take a bath, shaking vigorously and splashing everywhere. It was quite fun to watch as I've never seen a Bluebird bathing before. I took lots of photos on continuous mode hoping to catch a neat splashing shot. I did get some but there was more splash than bird in most of the photos. 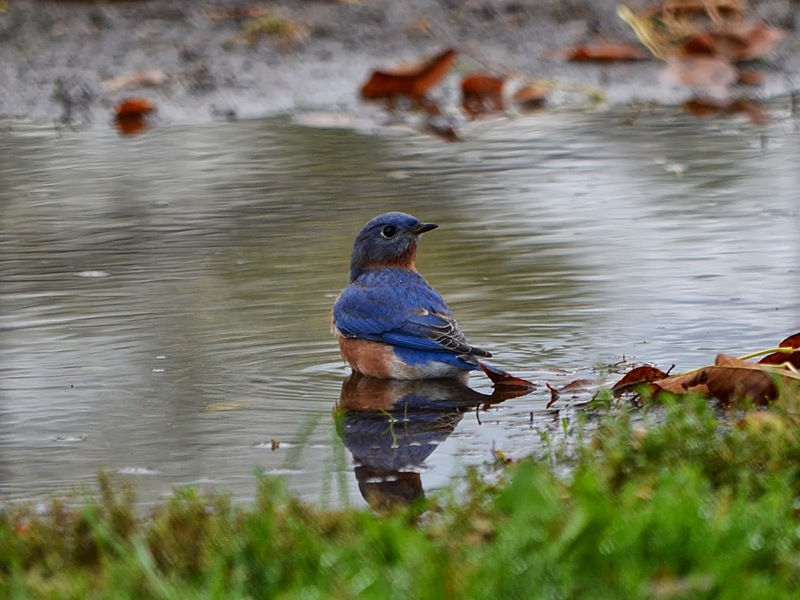 It was one of my favorite Bluebird encounters to date! Click here for maps of the area! Estimating that I walk between 1 and 3 miles per visit, I am tallying up the appropriate mileage based on each post to this blog. Friends of Palmer Lake Park are an organization of citizens wishing to protect, preserve and enhance this natural area and connect people to nature through education about the birds, plants and wildlife found within. Contact us at via email or click on our facebook link below!